Ah, ONE of my favorite cookies. 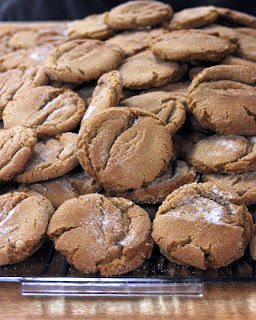 I like my gingersnaps on the softer side, and you can't tell from that picture, but these are soft. Low fat too, but who's worried about that. ;o) These are from Betty, Betty Crocker. If you want them to look more like this, make sure you add the right amount of flour...which in some cases means you need to add more than the recipe calls for.